AICP members are responsible for logging Certification Maintenance (CM) credits and managing their online CM log. The following steps will assist AICP members with logging CM credits for live online, live in-person and on-demand education. AICP recommends CM providers provide these instructions at each event to assist AICP members. CM providers have found success by distributing these instructions either in the event program or printed on slips of paper at a CM sign in table. 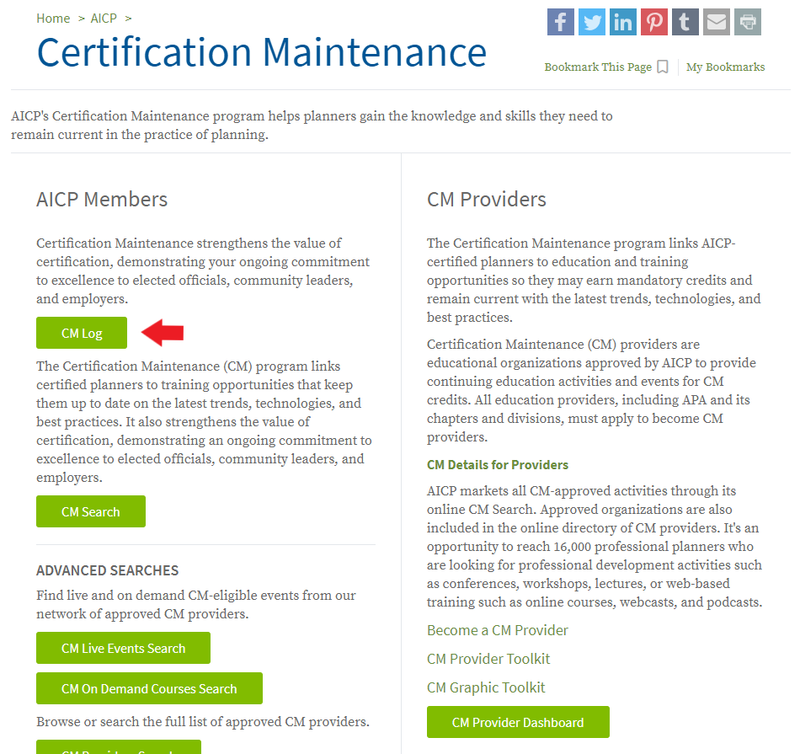 To get started, please visit the Certification Maintenance (CM) webpage of APA's website to claim your CM credits for participation. Log in using your APA ID number and website password. Click the green "CM Log" button. For more information about each event type, click the ? in the gray circle and a description will be provided. You can also add APA Learn courses to your CM Log immediately after completing the course in APA Learn. Learn more about logging CM in the APA Learn FAQ. Meeting type (free, APA, and archived events). If searching for an event by Provider, use the CM Provider Search located on the left menu options. Type in the name of the provider, and click Go. From the search results, select by clicking on the name of the provider. To log your CM credits, follow Step 5 and Step 6 below. If searching for a recorded webinar or streaming media product, use the Search On-Demand Courses option, located on the left menu options. Click Go. To log CM credits, follow Step 5 and Step 6 below. After locating your event, click on the "Add to My Log" text (see arrow below) to add to My Log. If this is a multipart event, you will have the option to select from a list of activity sessions, click "Add Activities to My Log." If you do not see the "Add to My Log" option, select the event title and the "Add to My Log" option should appear on the event's page. If you do not see the "Add to My Log" option on the event page, please contact AICPCM@planning.org. Evaluate the event by selecting the desired number of stars. Optional: Add a comment. Click on the checkbox to allow your comments to be published along with your name on the APA website. Answer the Ethics statement by clicking the box to confirm. 1. 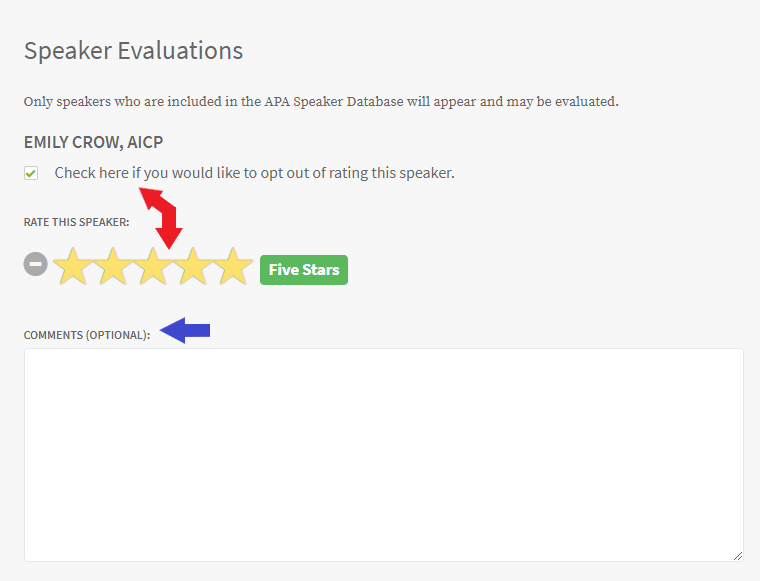 Evaluate the speaker by selecting the desired number of stars. 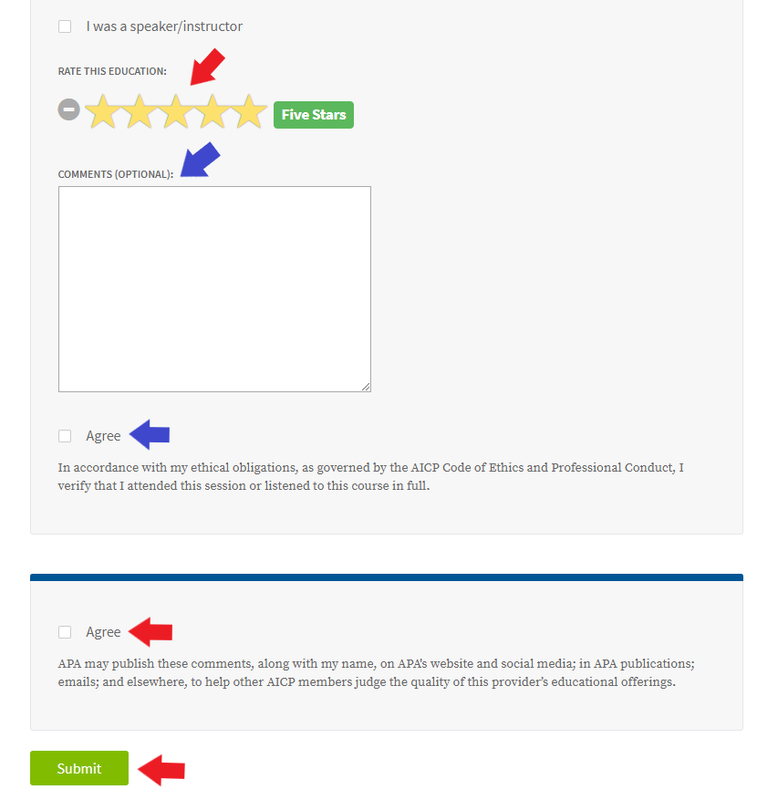 You may also add an optional comment and indicate whether it can be published together with your name on the APA website. 2. Check the "Click here if you would like to opt out of rating this speaker" checkbox and click the green Submit button. After you Submit, your CM credits will be added to your CM log and you will see a confirmation in the green bar confirming that you have "Successfully submitted your claim." Click the "X" to dismiss the message. If you wish to claim plus 1 CM credit as a speaker for preparation credit, click the checkbox to confirm "I was a speaker/instructor." Using the "Credits" dropdown menu, select the number that represents the total credits offered for the event PLUS 1 CM credit. For example: If the event at which you spoke offers a total of 1.0 CM credits, you add 1 CM credit for speaking and choose 2.0 CM credits from the dropdown menu. If you were a speaker and need to change the number of CM credits for an event, select the "I was a speaker/instructor" option to uncheck the box. Reselect the "I was a speaker/instructor" option. You then have the option to change the number of credits using the Credits dropdown. Make sure the total includes the total CM for the course and your 1 CM for preparation. If you need to edit an entry, find the entry in your CM log and select the "edit" option. The same fields that were visible when entering the event will appear again. You can edit any field and save.